Outfits for Hortense the Mouse™. 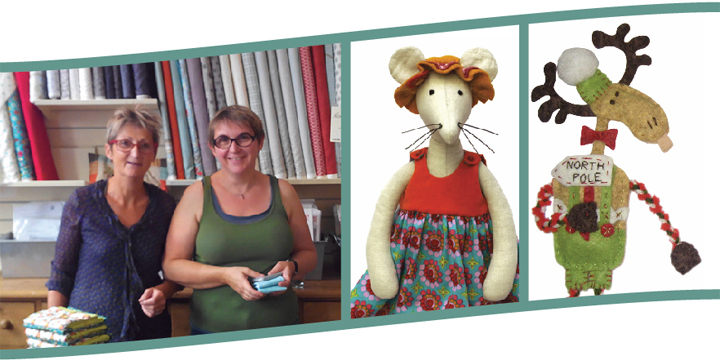 Our 2018 collection includes a wide array of softdolls patterns, including our star Hortense the Mouse™ since 2007. The tiny felt people collection include classics from childhood tales, litterature and Xmas ornaments. Our purses for boys and girls and tote-bags are printed with our designs. Our experience spans more than 25 years, including direct sales in our shops, in public trade shows, on the Internet. This allows us to adequately answer our professionnal customers requests. We design all our models, and we can also sell exclusive collections designed with your colors. Do not hesitate to contact us! Download our Wholesaler Catalog. Last update: february, 2019. Download our Terms and Conditions. Last update: february, 2019. Hi! We are two sisters, Véronique and Bénédicte, born with a needle in one hand and a pencil in the other. We are patchwork, sewing and embroideries lovers, and we have been working together for 25 years, designing patterns and kits. We are very excited to present you our patterns! We hope you will enjoy our products as much as we enjoyed designing them. 14 Days a Week™ is a trademark of ABCDAIRES SARL, a company founded in 1990.